First off I feel that NYC's Plazas program has created some of the best public spaces in the city. This includes the Flatiron Plaza. So this post is not about fixing a bad space, it's about making a good space into an even better one. and on the next block downtown still more seating. 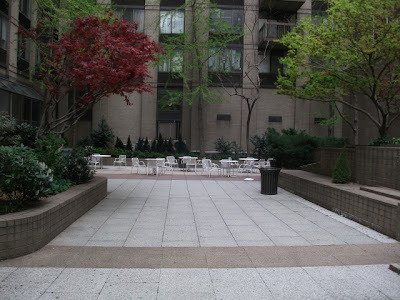 The nearest public adult active recreation areas are quite a distance from the Flatiron Plaza area. Here's an idea-why not add active recreation to at least one of these area? Fitness trainers have discovered that Park Benches can double as fitness equipment. So just by adding signage that shows how, Madison Square Parks sitting benches can become Madison Square Parks fitness benches. To see how click here. Another idea is concrete table tennis tables (cost 2 for $8,000), but due to traffic on the plaza, we'd only recommend this for Madison Square Park. One of the characteristics of a Great Public Space as defined by the Project for Public Spaces is: Does the space encourage communication or interaction between strangers? Beyond active recreation it's also possible to add passive activities to our plazas/parks that help create community Bryant Park and Washington Square Park do an excellent job of doing this. There is no reason why ways can't be found to do this for our neighborhood outdoor parks and plazas. There is no need for a lot of space to do this. On Parking Day people create spaces in parking spots that allow social interaction games to occur in a space the size of a parking spot. Parking Day is a only once a year, so here is the Lotus garden on the upper west side where there is room to play games in a relatively small garden space. 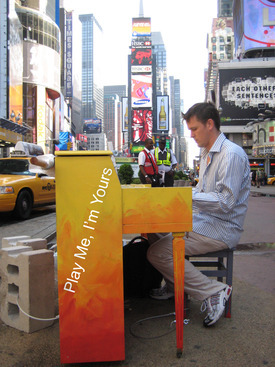 Credit "Photograph by Amarynth Sichel"
This piano in Times Square was part of the Play Me I'm Yours Project. Why not add a permanent piano to Flatiron Plaza?